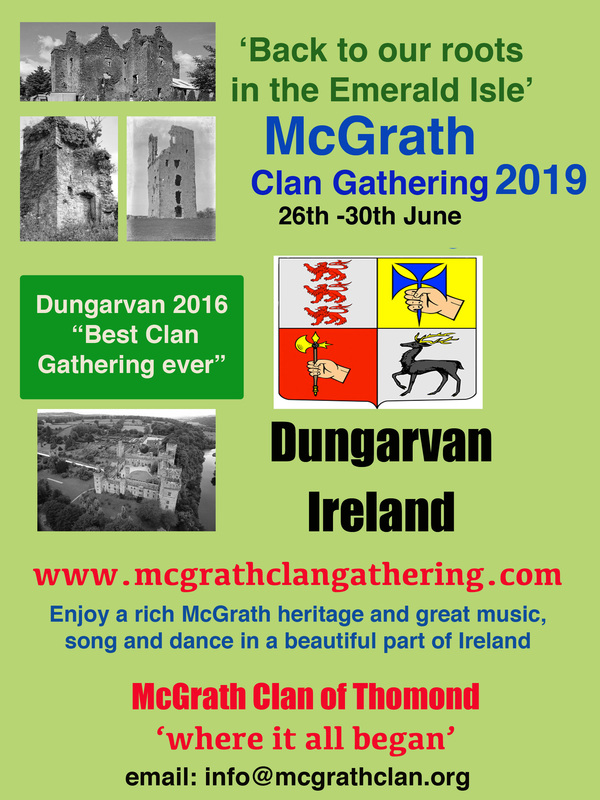 Only 7 weeks to go to the McGrath Clan Gathering 2013. The time table is ready and we’re all set to welcome everyone to Dungarvan. Anyone who wishes to buy a Clan Polo Shirt(€25) must have their orders in before end of May. Bookings for Clan Dinner, contact Martina McGrath on 086 2326598 or 0035386 2326598 or John McGrath on 087 9818473 or 00353879818473. Anyone who has booked option 1 or 2, do not need to book their ticket for the Clan Dinner, as it’s included. Clan Dinner Tickets €25.00. Golf, please drop an email to; danmcgrathmedia@gmail.com, if you wish to play in the golf. We have been given reduced green fees for the afternoon. Bring a friend along to play the Gold Coast Golf Course overlooking Dungarvan Bay. Cost of Golf €25.00. This entry was posted in Uncategorized on April 30, 2013 by McGrath Clan (official). I am interested in playing in the golf game but I don’t see anywhere that it tells me what day it is on. now that I know what day the golf game is on, can someone tell me if the golf course rents clubs or must I bring my own???? ?